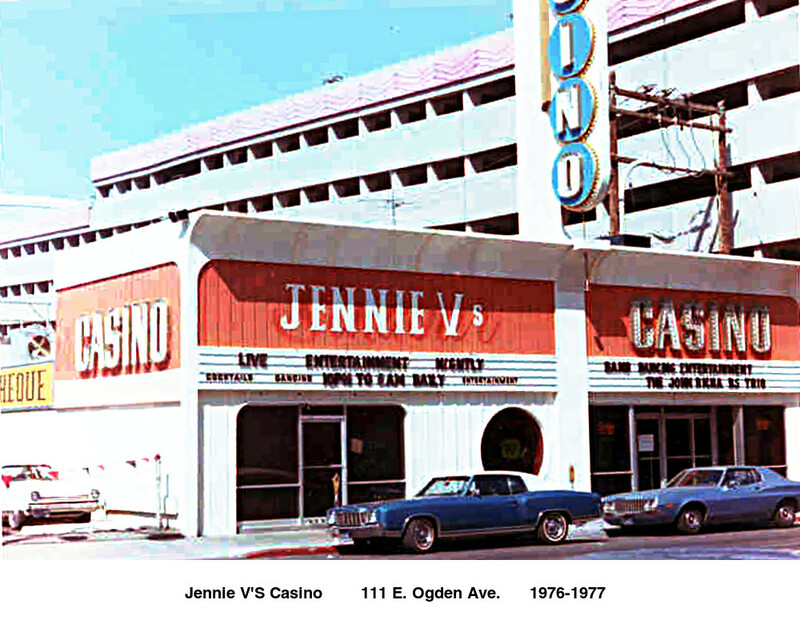 Jennie V's opened in 1976 and had five 21 tables, a craps table, a Big Six Wheel, 22 slot machines and a bar. It was opened by a somewhat unlikely trio comprised of a California doctor, an airline pilot, and a pit boss from the Sahara Hotel. Steve Lazarus was an undergraduate at UNLV from 1963 through 1967 and worked his way through school dealing in 14 different casinos. It was a punishing routine of school during the day and dealing at night. When he graduated in 1967, he became the first student from UNLV (then called Nevada Southern University) to ever be accepted to medical school (Univ. of Oregon). He received his MD in 1971 and eventually moved to Southern California where he was an emergency room physician for forty years, retiring in 2012. In 1975 Dr. Lazarus was contacted by an old Las Vegas friend, Gene Wintermote, who at the time worked for the the Sahara Hotel. Wintermote proposed that they get together with another mutual friend, Sandy Demonds who was then an airline pilot for Continental Airlines, and buy a small slot machine casino owned by the legendary Bob Stupak. The trio secured a loan from Nevada State Bank, eventually went to Carson City before the Nevada State Gaming Control Commission, and got their gambling licenses. Jennie V’s was named after Gene Wintermote's daughter and finally opened in 1976. They only ran the casino for about a year. Sandy Demonds and Dr. Steve Lazarus both had full time careers in Southern California and found it impractical to be onsite owners. Gene Wintermote found he couldn't handle it alone so the casino joined many other short lived operations in downtown Las Vegas. The Vault Casino in downtown Las Vegas was sold to longtime gaming executive Gene Wintermote by Bob Stupak, Wintermote is currently an executive with the Sahara Hotel and was previously associated with the Fremont Hotel. 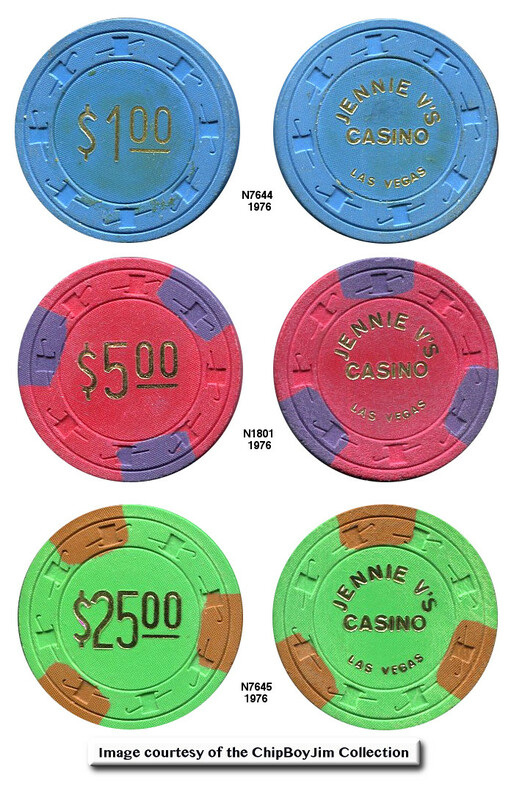 The rare Jennie V's chips below are courtesy of the ChipBoyJim collection. 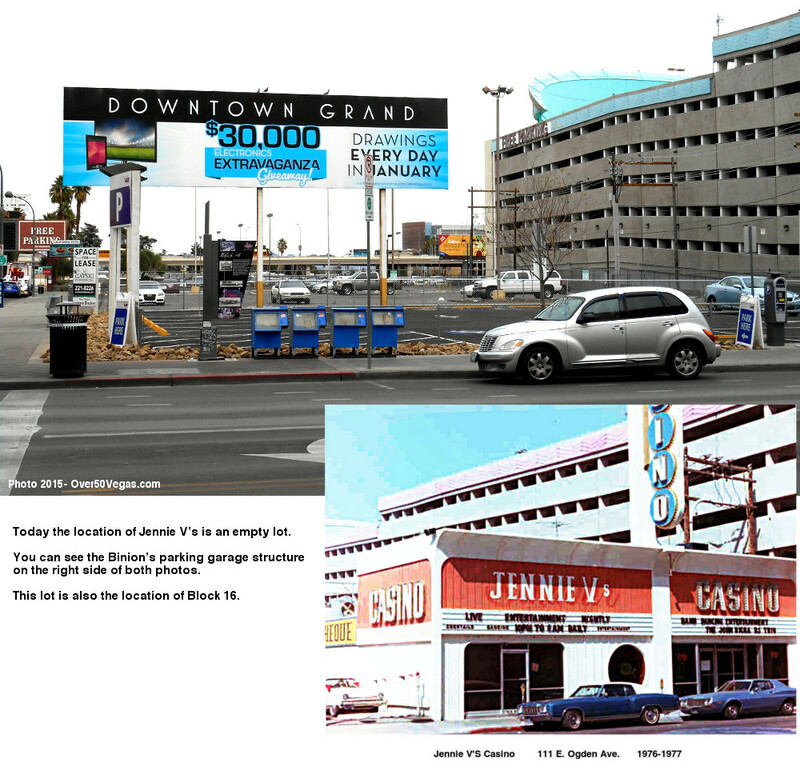 Newspaper ad published in the short-lived Las Vegas Panorama on May 21, 1976 that shows that Jenny V's had a restaurant. 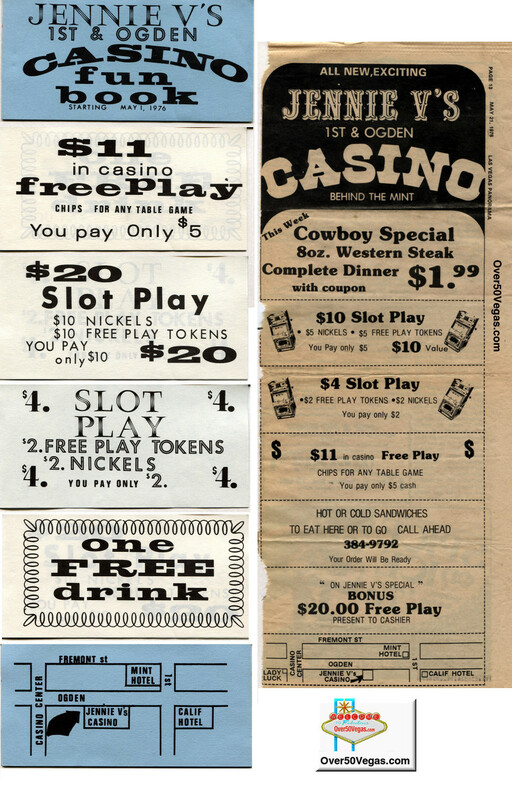 The ad also mentions "Free Play Tokens" although I have never seen one or the "Free Play" table chips mentioned. There is a $5 paper sticker on washer known but that wouldn't have been used in slots.